The gentle way to clean baby’s skin where it’s most needed – on hands and face and around the eyes. 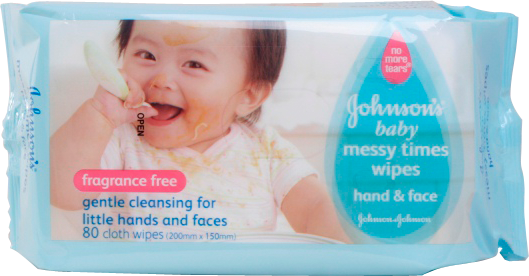 These extra soft wipes contain a gentle water-based cleanser that is specially designed to gently clean baby’s delicate hands and face. With the patented No More Tears® formula these wipes are gentle enough to use around baby’s eyes. A gentle way to a cleaner baby. Partially peel back sealing sticker and wipes are ready for use. Replace sealing sticker to prevent wipes from drying out.